Michiana Relief Sale Quilt. The Maple Leaf Quilters' contribution to the Michiana Relief Sale Quilt Auction netted $650 for Mennonite Central Committee World Relief activities. Thanks to all the MLQers who contributed hours of piecing and quilting to finish the Scrappy Nine Patch quilt with an appliqued vine border. "Dye-namic Hand Dyes" Color Blocks Kit Available. 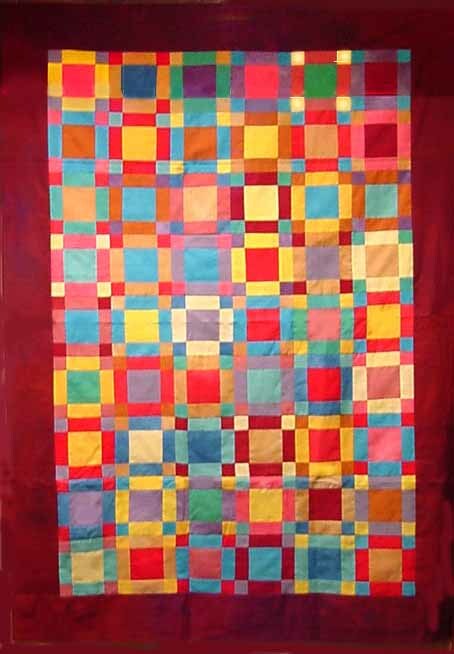 MLQer Fran Hathaway has put together a pattern and fabric kit for this fun little quilt. The kit combines 3" strips of Fran's wonderful hand-dyed fabrics - one strip each of 18 different colors - with an easy-to-make pattern. Colors vary from kit to kit (border fabric is not included but is available from Fran). This is a great one-day project, one day because once you start it you'll find it difficult to stop once you get started, "like eating one potato chip!" The kit is $20. THANK YOU ELAINE, JANIS, AND EDITH! Middlebury Amish Harvest Festival, October 5, 6 & 7. These MLQers made up the committee planning our participation in this annual local event held on the Essenhaus grounds. In spite of rain, wind and snow, the Maple Leaf Quilters were on site and available to demontrate various quilting technics and tools. We also provided hands-on opportunities for visitors to the festival to make their own quilt block. The display included a small quilt show, and examples of sewing machines from old to new including a treadle machine, Singer Featherweight, and an electronic embroidery machine. Monday, October 23, 6:30 PM. Guild Guest Night. 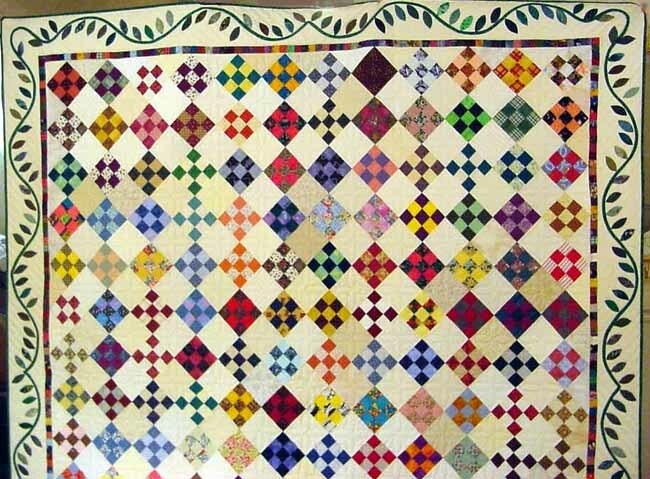 Maple Leaf Quilters will host a Coffee/Show & Tell Evening for area quilt guilds, including groups from New Paris, Syracuse, Elkhart and North Webster. Each MLQer is asked to bring a small plate of cookies. We will also be serving coffee and punch. If you wish, you may also bring something quilt-related to donate as a doorprize for the evening. Saturday, November 11, 11:00 AM. Sewing Workshop for the Cancer Treatment Centers of America Quilt. At Goshen General Hospital, Pebble Auditorium. Bring a sewing machine. We will be sewing the quilt top together. Monday, November 13, 7:00 PM. Sew What/Business Meeting. Monday, November 27, 6:30 PM. Annual Thanksgiving Carry-In Dinner and Challenge Night. Our Fall Challenge (Something Fall and Winter) quilts will be displayed. Bring a dish to share. Guests are welcome! December - No Meeting. Happy Holidays! Monday, January 8, 7:00 PM. Sew What/Business Meeting. Monday, January 22, 6:30 PM. To be announced. February, 2001. EQ4 Seminar. Date/location to be announced. Are you are interested in learning more about the quilt design software program, Electric Quilt 4.0? This seminar is an opportunity to learn more about EQ4, learn some pointers, familiarize yourself with the capabitilities of the program. If you wish to attend, please contact Nancy Smith, at 293-3846 or e-mail Aztech.@prodigy.net. MLQ FALL CHALLENGE. This Fall's quilt challenge is "Fall and Winter." There are no size or construction restraints - anything goes - just represent Fall and Winter in a quilt. The finished pieces will be displayed at our November meeting. Just a "heads up" on this challenge so you can be planning -- next Spring's challenge will be "Spring and Summer." Contact Nancy Smith if you have questions. November 16, 17, 18 & 19, 2000. Dear Jane Retreat, Farmstead Inn, Shipshewana. Join Dear Jane quilters coming from all over the US and beyond for this semi-annual retreat. The Spring 2001 retreat dates are the first weekend in May. March 1 - 3, 2001. 10th Annual Indiana Heritage Quilt Show, Bloomington Convention Center, 302 S College Ave, Bloomington, IN. For more information, www.ihqs-quiltshow.org. This is a major quilt event in Indiana, featuring nationally known award-winning teachers. The FabShop Hop2 Bunny will guide you from store to store, and when you get there, find another bunny hidden somewhere on the site. Click on the bunny, sign in to show you've been there and continue on your journey. Sign up today at www.fabshophop.com to join FabShop Hop2 for October 1-31. For more information on the October FabShop Hop2, contact Laurie Harsh, The Fabric Shop Network, P.O. Box 4128, Vancouver, WA 98662, (360) 892-6500, fax (360) 892-6700, e-mail fabshophop@aol.com or visit the web site at www.fabshophop.com.